It’s nice to think that the holidays are bigger than politics. With a long, hard election behind us, the healing can begin as Democrats and Republicans unite in an annual binge of communal consumerism. Alas, it’s not that simple. America’s red/blue divide goes deeper than the ballot box. The socioeconomic targeting and demographic slicing that are all the rage now in Washington actually have their roots in consumer marketing. And as the commercial niche-ing practices have grown (and grown better), the red/blue divide has become another way for retailers to better understand where to place their ads and their stores. What the data show: Democrats and Republicans not only see the world differently and vote differently, they often shop differently. You can see those differences in the data of Experian Simmons, a consumer research firm that tracks the shopping habits of Democrats and Republicans with a massive survey. The red/blue retail divide is not easy to understand. It’s not easily broken down by income. In some cases it seems to be driven by geography–where stores are located and where their roots are. But there also seems to be a political/cultural divide running through the nation’s retailers in many cases. Some of the retail divide is tied to basic demographics. Women are more likely to be Democrats than men, particularly young single women, so it may not be a surprise that the store that is most heavily Democratic in its customer base is Lady Footlocker. Democrats are 40% more likely to shop at the chain than average, while Republicans are only half as likely to shop there. But opening a women’s shoe store doesn’t guarantee a flock of Obama supporters. Naturalizer Shoes, which bases its marketing appeal on making comfortable women’s footwear, has a shopper base friendlier to the GOP. 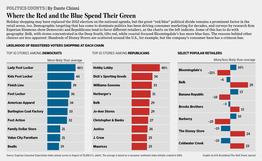 Republicans are 8% more likely than average to shop there, while Democrats are 22% less likely. For the rest of this Politics Counts column, please visit the Wall Street Journal's website. You'll need a subscription.